Murphy met our excellent Dobro instructor Mark Panfil while teaching at the Augusta Heritage workshops in Elkins, WVa. We had been looking for a Dobro instructor for a long time and Mark fit the position perfectly. From Western New York, where he has taught music at Pinehurst Elementary School for more than twenty years, Mark is one of the nicest people you could ever meet. His playing is superb, always tasteful, and always appropriate, and his teaching is clear and concise. 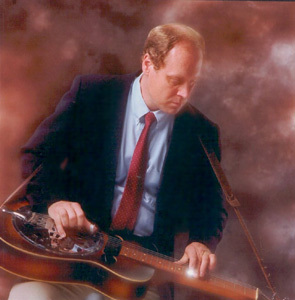 He has played Dobro with the band Creek Bend since 1983. Before that he played in several local bands including the Erie Lackawanna Railroad with his brother Chris and the Hill Brothers, a school performance group for Young Audiences, Inc. He is a member of the Bluegrass in the Schools Committee for the IBMA. As well as playing Dobro he also sings lead and baritone and plays banjo and harmonica. And on top of all that, he directs a student fiddle group and the Elementary School Harmonica Club. Mark offers video lessons on demand (he'll take requests and make you a lesson) on both dobro and harmonica. You can find out more about Mark and contact him through his website: markpanfil.com or MySpace page: myspace.com/markpanfill.